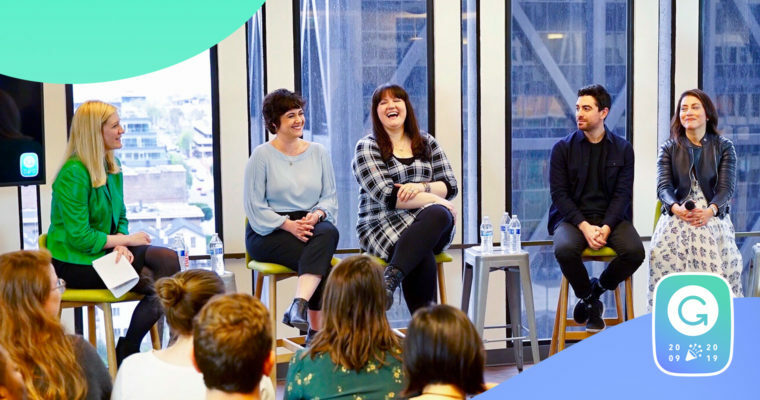 In honor of Grammarly’s 10th anniversary, we held a panel discussion about the role technology plays in our communication today. Together, panelists shared personal stories and offered insightful advice on navigating today’s complex, always-on world. I spoke on the panel alongside David Rosenberg from GIPHY, Anna Soellner from Reddit, and Amanda Atkins from Slack. Katherine Boyle from General Catalyst guided us through a lively conversation about the many ways tech helps us connect, what it means to live in an on-demand world, and ultimately, how to find balance in effective communication. We interact in so many different ways today, often instantaneously. And while GIPHY, Grammarly, Reddit, and Slack all approach communication in their own unique ways, the common thread we discovered was that, quite simply, people want to be understood. Over the last ten years, a myriad of new communication channels have emerged, and the volume of writing has increased with them. At Grammarly, we focus on the substance and not on the methods by which we communicate. Instead of adding to the growing list of channels, we’re excited about helping people reach their goals, connect with others, and express themselves in ways that help them be understood by their audiences. Amanda Atkins, director of internal communications at Slack, shared how more voices and perspectives can be heard with the speed and collaborative nature of Slack. Interactions that once took place around the watercooler can now happen online, reaching across teams at work and to unique individuals across communities. This type of communication also allows concerns or issues to be elevated more visibly and fixed more immediately. Employees have the opportunity to learn much more about their coworkers, workplace, and the world around them — both in a physical workspace and distributed workforce — than ever before. Trust is critical to how we learn and communicate, and building trust in-person is very different from how we do so online. Anna Soellner, director of communications at Reddit, elaborated on how the company relies on user trust for its communities to thrive. By setting their own community standards, moderators have the power to determine what their culture is going to be. Establishing this autonomy and self-regulation allows members to interact freely without oversight from Reddit unless deemed absolutely necessary. As a research scientist, I’m very emphatic about the notion that artificial intelligence is only as reliable as the data set it’s trained on. While we continue to develop better algorithms, we can’t ignore the importance of human guidance and intervention. David Rosenberg, head of business development at GIPHY, discussed the challenging battle between algorithmic ranking and human editorial content when it comes to indexing a vast catalog of visual media. There is a layer of complexity that comes with assigning words to images and it becomes even more complex when you have to rank them in search. Algorithms can be continuously improved and trained, but for now, there is still a need for human editors to suss out meaning that accounts for tone, emotion, and even cultural sensitivity from images. Effective communication, in all its forms, can build community, empower the voiceless and bridge the gaps between us. As Grammarly celebrates ten years in the world of digital communication, we look forward to another decade of progress!